The Montgomery Ward catalog is a home decor catalog/furniture catalog that sells home decor for your bedroom, bathroom, kitchen, dining room, and outdoor living areas. 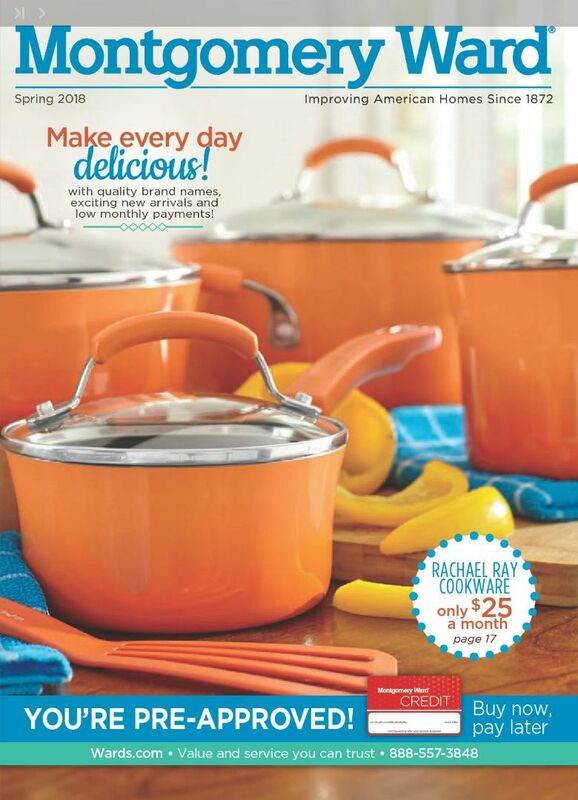 Besides featuring home decor, the catalog also sells housewares, tools, electronics, jewelry, clothing, gifts, and toys. For over 140 years, the Montgomery Ward catalog has been an American institution, and in the late 19th century and early 20th century, it was a must-have for the American home. If you would like a free Montgomery Ward catalog mailed to your home, you'll need first to visit Montgomery Ward's Request A Catalog page. On that catalog request page, fill out the form with your first and last name, plus the full mailing address for where the catalog should be shipped. Also be sure to select the catalogs that you want to have mailed to you. Note: You can fill out the form with your email address and phone number too, but you don't have to do that. You can also sign up for promotional emails from Montgomery Ward, but it's not necessary to get your free catalog. When finished, you can instantly send in your request for the free Montgomery Ward catalog through the SEND REQUEST button at the bottom of the form. It shouldn't take longer than 3-4 weeks to arrive. Note: If you'd rather not fill out this form, or the form isn't working for you, you can also order a free catalog by calling Montgomery Ward at 1-877-784-2836 or by emailing the company. The Montgomery Ward catalog can be mailed to United States addresses and to APO/FPO addresses, as well as to dozens of other countries. If your country isn't listed or if you'd rather look through the catalog right now without waiting for it to arrive in the mail, you can view Montgomery Ward's catalogs online. You can find the online catalogs for Montgomery Ward the Online Catalog section of its website. Just pick the catalog you want to view to instantly open it in your browser—you don't have to download anything to view these catalogs. Once you've opened the catalog, you can use the controls at the top of the page to move left and right through it. You can also zoom in on the pages and open the whole catalog as a list of thumbnails so you can quickly move to a different page. If you like the Montgomery Ward catalog, you'll also like catalogs from Ballard Designs, ​Collections Etc., Brylane Home, Garnet Hill, Grandin Road, and Pottery Barn. You can also shop at Montgomery Ward through its website at Wards.com. It's easy to order items this way because you can just add them to your shopping cart and check out like you would when ordering anything else online. Some of the categories where you can find their items are Bed & Bath, Kitchen, Furniture, Home, Electronics, Health & Beauty, Gifts & Toys, Jewelry, Women's, Men's, and Kids'. All of these are listed at the bottom of the webpage, and each of them has subsections inside those categories to help you find more specific items. There's also a menu item on Wards.com that's just for sale items. In it are subsections for finding discounted items in each of the aforementioned categories.